A Florida cemetery worker has been arrested and charged with stealing the credit card of a deceased U.S. sailor and World War II veteran and making unauthorized purchases, police say. 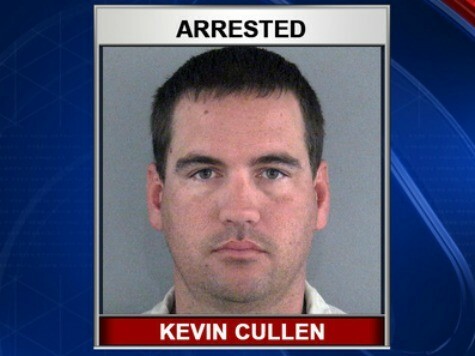 Sumter County, Florida, officials arrested Kevin A. Cullen, 33, a grave digger at the Florida National Cemetery after family members of the deceased veteran began to see newly charged items appearing on their relative’s credit information. When the family of the veteran who passed away at 93 started to wrap up the man’s financial affairs, they noticed items charged in Bushnell, Florida, that were purchased months after the veteran died. Such items as pizza and video game cards were included in the charges. The veteran was a U.S. Navy torpedoman in the Atlantic theater during World War II. An investigation by the Sumter County Sheriff’s Office allegedly revealed that Cullen had discovered the veteran’s wallet, which had been left with an urn containing his ashes. A police report states that Cullen admitted to keeping the wallet and later fraudulently using the credit cards inside. The cemetery worker was arrested and charged with a variety of charges, including theft and disturbing the contents in the urn. He was booked into the Sumter County Detention Center on $11,000 bond. A Sheriff’s Office spokesman said they were also investigating whether Cullen had done anything like this before.